Gone are the days of traditional book reading. With new technology being introduced every day, book reading had now gone modern in the form of audiobooks. An audiobook is a recording of a text being read. There’s no difference when it comes to the content but readers don’t have to physically read the book. Instead, all you have to do is to listen to the voiceover. In this case, audiobook won’t strain your eyes and you can use your hands freely to do other tasks while enjoying it. However, it will cost you a good amount of cash to get all you loved audiobooks. And a nice news here is that there are lots free audiobook download sites, just read the following content to explore more resources. From classics to hot selling labels, you can find all these audiobooks on the sites below. Owned by Amazon company, Audible is one of the largest online digital stores selling different kinds of audiobook all over the world. There are more than 180,000 titles to choose from ranging from best sellers to new releases. Sadly, not all the audiobooks on this site are free. Most audiobooks will cost you around $30 or more depending on the popularity of the title. 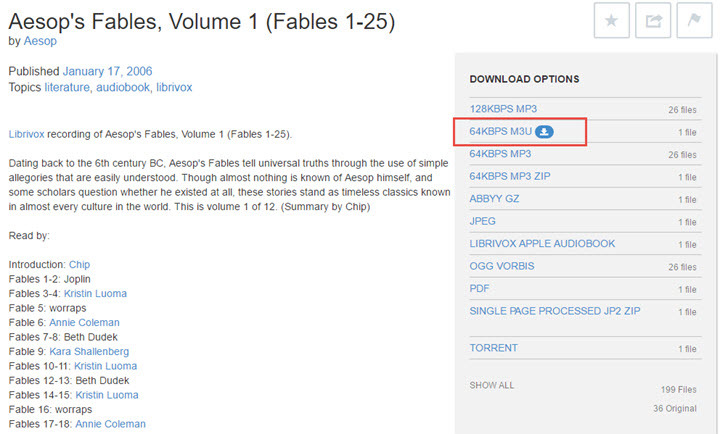 Then, in order to download a free audiobook, here is the best way for you. Create an Audible account by clicking the “Get my free audiobook” icon the homepage. Click “Membership” and “Join the Free Trial Service”. Choose between the $14.95 or $22.95 plan, it doesn’t actually matter. Filling in other required information on the registration page. Rest assured that you will not be charged for anything if you stop the subscription before the trial ends. Browse Audible’s collection of audiobooks or search the book title you want. Once you find the book you want to listen, just click the “Free get” to save it. The audiobook will then be added automatically to your Audible library. You can download the file or play it online instantly. Another site which allows you to download free audiobooks is YouTube. We all know for a fact that YouTube is a video hosting website, but this doesn’t limit it for being able to house a huge collection of audiobooks. To look for your favorite book, simply search it by entering the (book title) + audiobook. Unlike Audible, every audiobook available on YouTube is 100% free. Though, the trick here is to convert the online audiobook’s video to an acceptable audio format for you play it offline. Find the audiobook you want by using YouTube’s search function, copy the URL of the page containing audiobook. Go to the YouTube video to MP3 converter site. Paste the video link into the space provided, then click the “Convert” button. Follow the instruction to install a launcher, then the converter will begin to analyze the URL and convert online audiobook to MP3. The conversion process will display on the webpage. Once done, the destination folder which contains the audiobook will pop up. Later, it is free to play the audiobooks on PC or transfer them to tablets and smartphones. Among all the free audiobook download sites, Open Culture is intended for providing cultural and educational purposes. It features a large collection of audiobooks ranging from astronomy to religion. Popular series such as the Harry Potter, recordings from various authors, academic audiobooks, language-specified audiobooks and free courses can be found as well. There are also eBooks, movies and PDF textbooks available. Luckily, downloading audiobook on the site is quite simple. Browse their collection by clicking “Audio Books” on the top section. You could equally use the search function for more specific results. Once you enter the audiobook’s page, there is a list of resources where you can get the book. Simply click one of these links, you can either stream it directly on the site or download the file on your computer. For downloading the file, select a folder on your computer to store it. Afterwards, the downloading will proceed on the browser immediately. 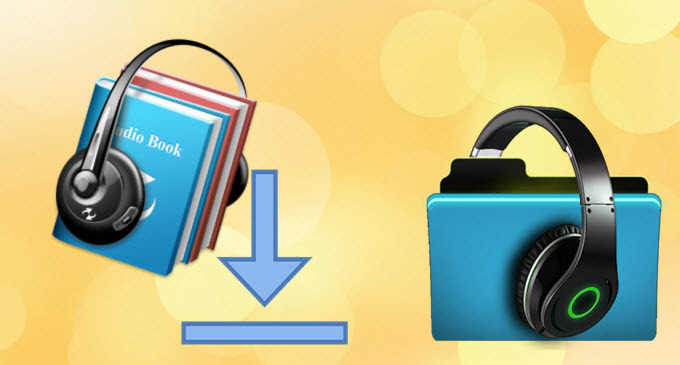 With tons of audiobooks at hand, you may have the demand for burning audiobooks onto a CD. By doing so, you can keep a copy of the valuable audiobooks, organize them well and share your favorite audiobooks with friends easily. To burn audiobook to CD, a program called OverDrive is recommended. Download and install OverDrive on your PC. 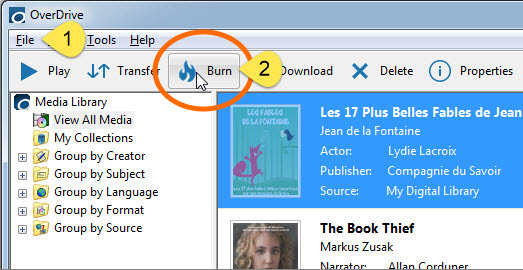 Open the application and import the audiobook you want to burn, click the “Burn” button on the top of interface. Insert a blank CD into your computer and hit “Next”. Once the burn wizard detects the CD driver, it will start audiobook burning. When it is done, a reminder will appear on the screen.